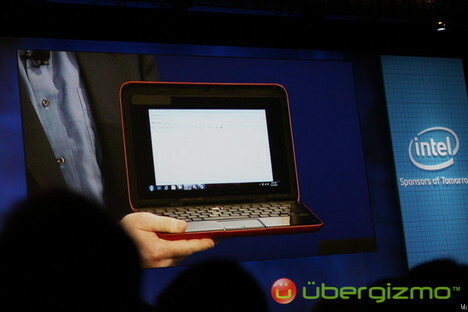 According to ubergizmo.com, Dell demonstrated an iPad-sized tablet device with a fold-out keyboard that runs Windows 7 at the Intel developer forum. While convertible tablets running a Windows OS are nothing new, it’s a bit surprising that Dell is starting to market one right now to compete with the iPad. In some ways this makes sense — having a keyboard and being able to run standard Windows applications will appeal to those wanting a light-weight tablet — but the success of the iPad is due in equal parts to hardware and software design, and Windows 7 applications are no match for iPad apps. Without a coherent user experience design and a device-appropriate user interface, the Inspiron Duo will be doomed to compete with netbooks, a rather smaller and less glorious market than the iPad. I wonder if between Dell and MS, they will try to create some sort of a UI library that would make it easy to build user interfaces appropriate to the device. I bet it wouldn’t be so hard to do the development; the hard part would be to create a coherent look and feel. The other question on my mind: will it have a stylus? The implication from the Gizmodo piece was that it was finger-activated, but Windows 7 incorporates all the stylus-support of the old Tablet OS. It’ll be interesting to get my hands on this device. In the long standing windows legacy is there is no single purpose widget in their tablet library. The stylus was more of an auxiliary support like adding an accessibility layer; the mouse is still the default interaction. A richer UI library for Windows7 would still suffer the same fate; they need applications which _dont_ work with the mouse at all before they can start to innovate. When we started the XLibris work (before there was a Tablet OS), we wrote code that was designed for a stylus but also worked with a mouse. When I say “designed for a stylus” I mean we didn’t have hover as an interaction method, didn’t have double-tap operations, etc. Having backwards compatibility with a mouse, however, was important not just for debugging, but also for having a backup if the stylus was misplaced. On the other hand, the downside of not having stylus support in the OS level was that we couldn’t take advantage of acceleration and angle to characterize strokes the way that the Tablet OS does. The upshot, I think, is that you need to design your interactions for the stylus first, and the mouse second. But you probably need both. The challenge for MS is that their designs tend to be horizontal when vertical is the appropriate way to go. Perhaps the right way to solve this problem productively is to partner with a developer who can build a UI appropriate layer on top of the existing OS. I think all the pieces are there; they just need to be put together in ways that MS finds organizationally challenging.